View More In Jelly-Roll Pans - Page 4. WHY CHOSE Umite Chef STAINLESS STEEL OVEN STEEL PAN? 1. Stainless steel is more healthy and non-toxic than aluminum. 2. Stainless steel is dishwasher-safe, but aluminum free. 3. Stainless steel is more easily to clean even hand-wash.
4. Stainless steel, food cook more evenly, less stick. This pan is the perfect size for smaller servings, The superior mirror finish for easy and effortless cleanup. 2. Please clean and dry the baking pan after using for its durability. 3. Make more delicious,have a good time. You can use a light spray or grease the pan with a little oil or butter to avoid food stick. * MORE HEALTHFUL: Great replacement to aluminum pan, no aluminum into your food.HEAHYSI baking sheet pan are made of high quality pure 430 stainless steel without chemical coating or any other materials. * MORE SAFE: The stainless steel baking pan Length 9 x Width 7 x Height 1 inch , Perfect size for home baking use, Super mirror finish surface always stay. shining and easy to release food, Smooth edges and rimless design would no cover dishwater . * KEEP CLEAN: The stainless steel baking tray for oven is full sides all around prevent food liquid flowing everywhere, Keep your oven neat.Easy clean up even in hand-wash.
* MORE STURDY: Stainless steel cookie sheets pan is sturdy and shiny, thick gauge 430 stainless steel material with heavy duty design, does not warp and is dishwasher safe.Rust resistant and durable for many years. 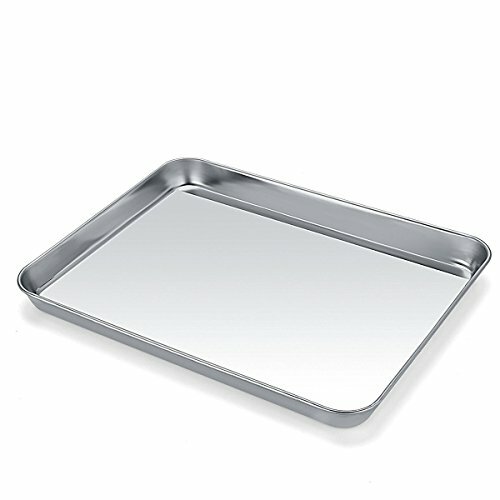 * MAKE DELICIOUS: The oven baking pan great for cinnamon rolls, Sticky buns, Brownies, Corn bread and fruit cobblers and etc, Food heated evenly and come out perfectly. If you have any questions about this product by Umite Chef, contact us by completing and submitting the form below. If you are looking for a specif part number, please include it with your message.